Advances in technology, along with miniaturization, means today’s hearing aid user now has considerable choice. Modern devices balance the natural desire for discretion about using a device with sophisticated implementation of hearing technology. For each hearing aid style there are a range of options and features depending on the model. For example, digital hearing aids are available in different specifications from basic to premium; and it is the technology and number of features that influences the cost, rather than the model itself. The difference between the two lies partially in how much input is required from you, the wearer. With a basic model as the wearer moves between different environments, they must manually adjust the aids volume level or switch between listening programs. However, premium devices detect these changes and respond automatically, so not input is required from the wearer. This is a constantly evolving area and as technology moves forward, so does the intuitive application of these advanced features. Hearing aids divide into In-the-Ear and Behind-the-Ear. Also, within each group there are different styles and features. These are discrete devices, and some models are virtually undetectable. They are worn within the ear canal and are custom made to fit form a cast taken of the ear itself. For added discretion they come in different skin tones to camouflage against the outer ear. In-the-ear devices come in a range of options, listed below from smallest to large. These nearly invisible devices offer a solution for mild to moderate hearing loss. The smallest custom fit styles of CIC fit deeply within the ear canal. Comfortable for the wearer and easy to use, the ITC fits in part of the ear bowl. The ITC has a slightly longer battery life compared to CIC models, thanks to its slightly larger size. This also allows for additional features such as volume controls, and directional microphones for superior listening in noisy environments. 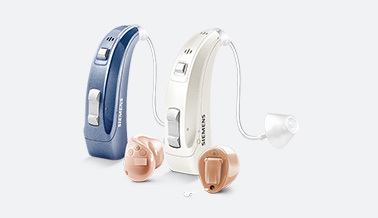 The ITC is suited to mild and moderate hearing loss. These discrete devices fit cradled within the bowl of the outer ear. Being slightly larger than an ITC allows for directional microphones, which require a presence on the outer part of the device. They also have the advantage of a larger battery to power a larger receiver, opening this up as an option for those with severe hearing loss. Behind-the-Ear styles are just that, with the body of the device sitting on top or behind the outer ear. The sound re-routes via tubing connected in the ear canal, secured with an ear mold. BTE devices are available in custom skin tones, but can also express your personal style as in leopard prints, chrome colors, and other funky designs which you will want to show off. Again, different sized BTEs incorporate different features, including battery type and power – larger devices have more power capacity than smaller ones. The small size of the Mini BTE means it sits discretely behind the outer ear with sound directed into the canal via ultra-thin tubing. A soft tip sits deep within the ear canal, but doesn’t block it. This allows for natural airflow in the canal and a great combination of amplified and natural sound. This “open fitting” is suitable for people with high frequency hearing loss that is mild or moderate. Here the longer shape of the BTE accommodates a volume control and program button. The ear mold fits snuggly in the ear bowl and is suitable all types of hearing loss, include profound. The style and color of the ear mold, along with the wearer’s hair style, determine the look for each individual.